Chinese racer Pin Tung was then faced with the daunting climb of 999 steps leading to the natural arch of Heaven's Gate. 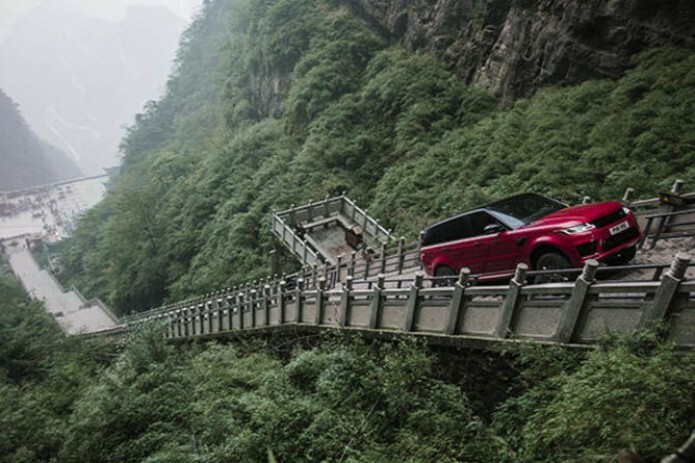 Formula E driver Ho-Pin Tung achieved a daring feat in China when he drove a Range Rover car up one of China's most well known landmarks at Tianmen Mountain. The Panasonic Jaguar Racing driver started out by driving along the 11.3km Tianmen Mountain Road (known as the Dragon Road) in Hunan province before arriving at the foot of the stairs leading to Heaven's Gate. Pin Tung was successful in his climb, breathed a sigh of relief at reaching the top of the stairway and celebrated becoming the first vehicle to ever achieve the feat.